Every foreign traveler in Japan is delighted by the verdant forest-shrouded mountains that thrust skyward from one end of the island chain to the other. The Japanese themselves are conscious of the lush green of their homeland, which they sometimes refer to as "the green archipelago." Yet, based on its fragile geography and centuries of extremely dense human occupation, Japan today should be an impoverished, slum-ridden, peasant society subsisting on a barren, eroded moonscape characterized by bald mountains and debris-strewn lowlands. 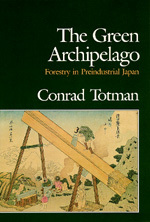 In fact, as Conrad Totman argues in this pathbreaking work based on prodigious research, this lush verdue is not a monument to nature's benevolence and Japanese aesthetic sensibilities, but the hard-earned result of generations of human toil that have converted the archipelago into one great forest preserve. Indeed, the author shows that until the late 1600s Japan was well on her way to ecological disaster due to exploitative forestry. During the Tokugawa period, however, an extraordinary change took place resulting in a system of "regenerative forestry" that averted the devastation of Japan's forests. The Green Archipelago is the only major Western-language work on this subject and a landmark not only in Japanese history, but in the history of the environment. Conrad Totman is Professor of History at Yale University and author of Japan Before Perry: A Short History (California, 1981) and Politics in the Tokugawa Bakufu, 1600-1843 (California, 1988).